A blind veteran from Surrey celebrated his 106th birthday on 18 August. 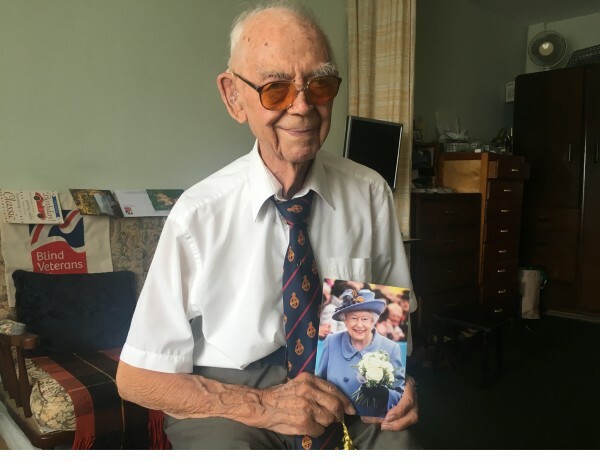 Stefan Ciesla was delighted to add to his collection of cards from the Queen, receiving his third from Her Majesty since turning 100. Stefan, who lives in Chessington, marked the occasion by celebrating with his daughter who lives locally. Born on 18 August 1912, Stefan joined the RAF in 1943 and trained as a Wireless Operator at RAF Halton until the end of the Second World War. Originally from Poland, Stefan’s journey to the UK began after his release from a Soviet labour camp during the war. He made the long journey from Siberia via Kazakhstan, across the Caspian Sea and eventually to England. After the war, Stefan worked as an organist and caretaker at a Polish Church in London and later worked as an accordion tuner and repairer, a career he continued for 45 years. Despite now having lost much of his sight, Stefan enjoys listening to the radio and outings with his daughter. John lost his sight due to age-related macular degeneration and has been supported by Blind Veterans UK, the national charity for vision-impaired ex-Service men and women, since 2009.